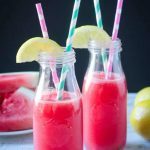 Easy Watermelon Juice – just three ingredients and quickly made in a blender! Super refreshing and hydrating. The perfect summer sip! One of my kids’ most favorite things about summer – watermelon! They can easily take down a whole one…a BIG one…in less than 2 days. We love eating it in triangles, in cubes, scooping it straight out of a watermelon half. And sometimes, we love drinking it! 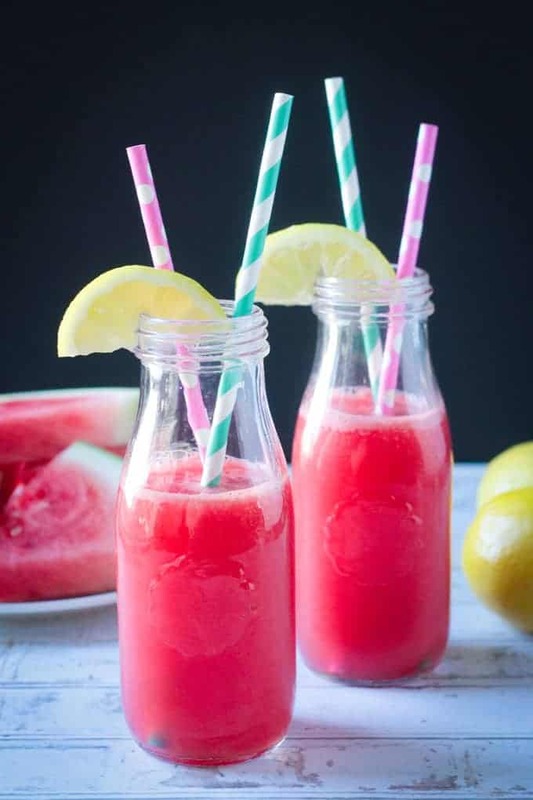 This Easy Watermelon Juice drink is cool, sweet, refreshing, and hydrating. It’s vibrant and gorgeous too! 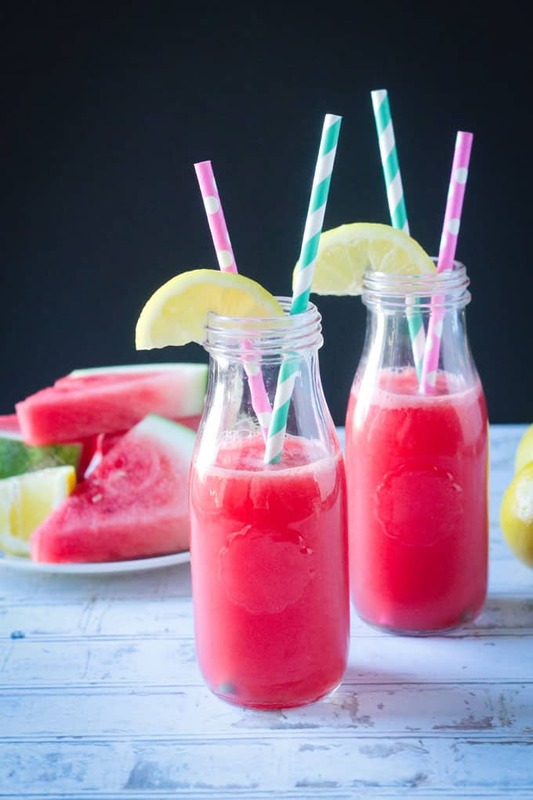 The best part is you don’t need a fancy juicer to make this watermelon juice! It’s easily made in a blender in just a few short minutes. Drink up! We aren’t much of a juice drinking family. Green juices, yes. Fruit juices, not so much. Most store bought fruit juices are loaded with added sugars – not exactly thirst quenching. 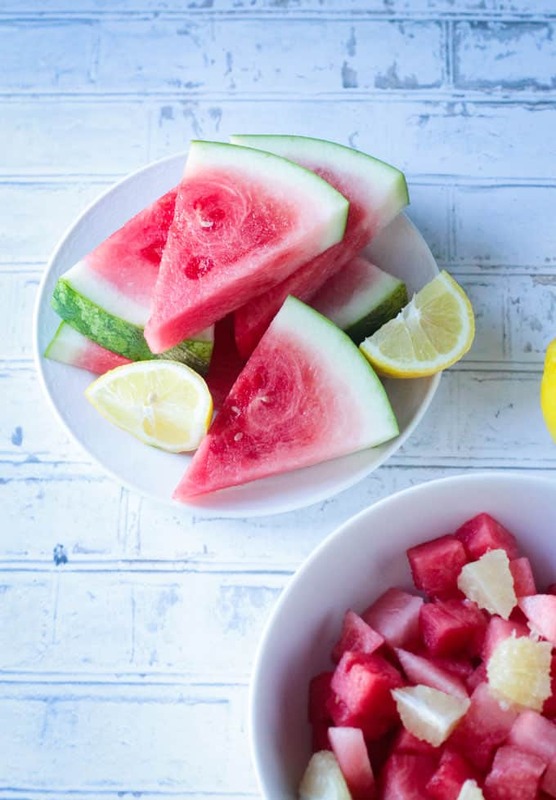 But summers just scream for cool, refreshing fruity sips, so we are making a healthy version at home! 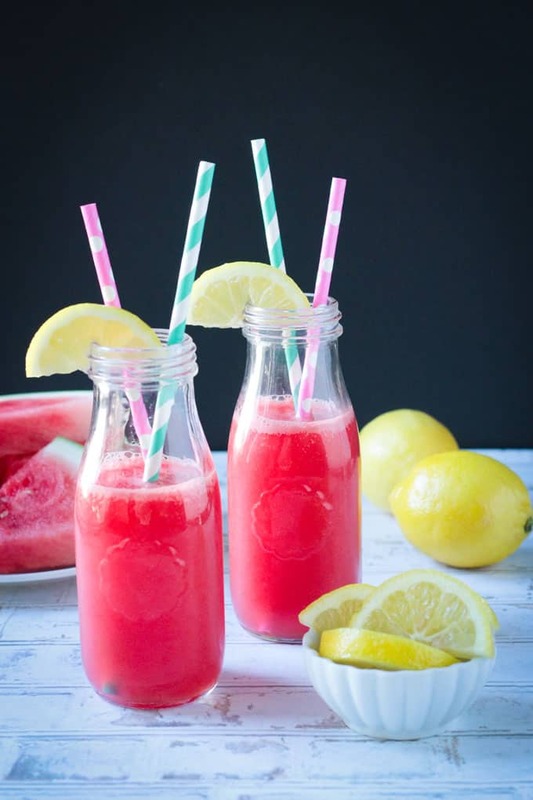 This watermelon juice combination of watermelon, lemon, and coconut water hits all the right notes and is just sweet enough all on it’s own. It’s been the perfect afternoon pick-me-up to quench our summer thirst. Made up of mostly water, this juicy red fruit is low in calories, but certainly not low in nutrients. 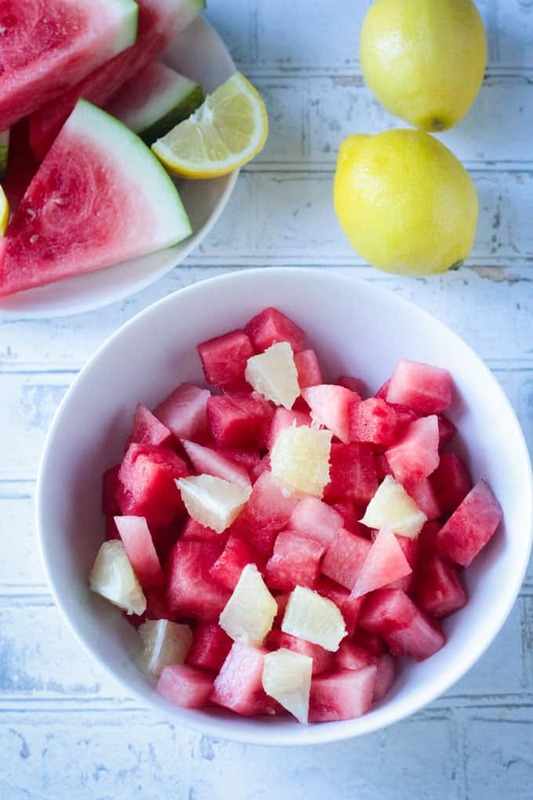 Watermelon is full of antioxidants and anti-inflammatory properties. It’s high in vitamin C, vitamin A, and B vitamins. Lycopene, which gives fruits and veggies their red pigment and has been linked to cardiovascular health and possible disease prevention, is abundant. There is more lycopene found in watermelon than tomatoes! Coconut water is the ultimate in hydration. It contains electrolytes, potassium, calcium, magnesium, sodium, and healthy natural sugars. It even contains protein and fiber! Want more coconut water recipes? 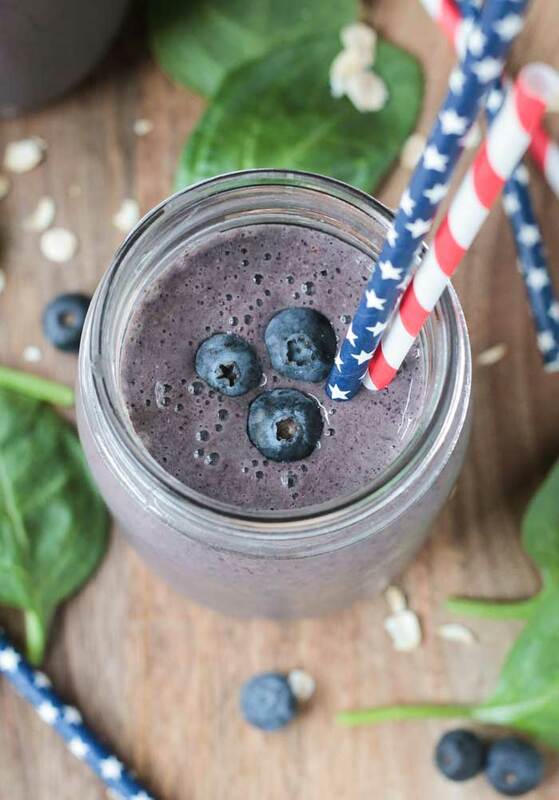 Try my Coconut Water Smoothie w/ Berries & Spinach or Post Workout Pineapple Smoothie. I have a few more ideas for this watermelon juice. We haven’t tried them yet, but they will be happening soon! This juice would make great popsicles. It would be similar to my Watermelon Popsicles with Cucumber and Lime with a slightly different flavor profile. I also think it would make a yummy cocktail. Maybe watermelon juice and vodka? Or tequila? But this would be for adults only, obviously. Don’t let the kids try this version! 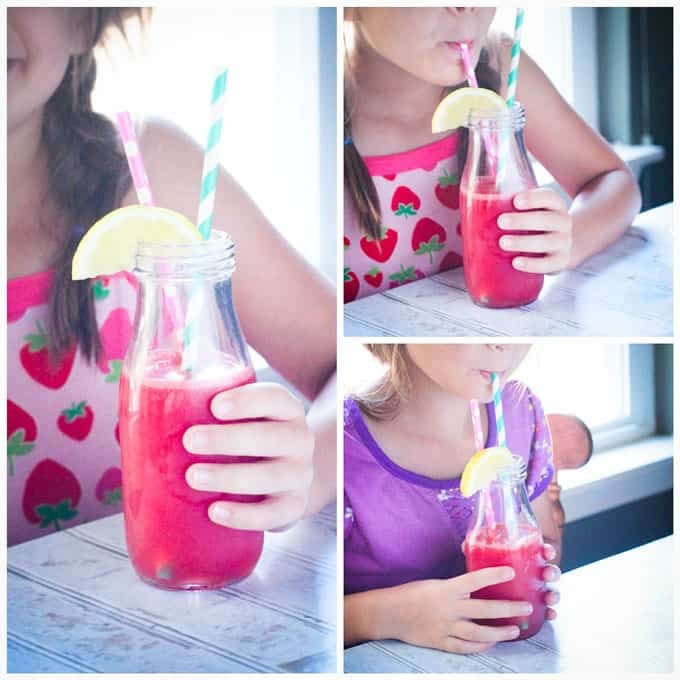 My kiddos loved this pretty pink juice as much as I did. They also loved sipping out of these super cute paper straws. It’s really a toss up which one they loved more. Some watermelons are sweeter than others. Try to find one that is heavy for its size and has a yellow spot from where it was lying on the ground. 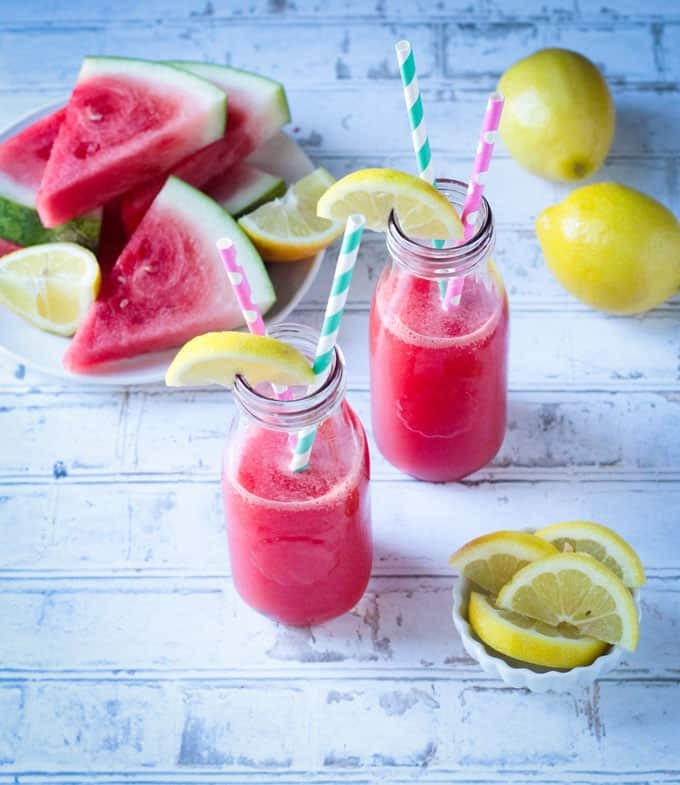 The natural sweetness from the watermelon and coconut water in this juice recipe should be all you need. However, if for some reason your watermelon isn’t all that sweet, feel free to add a tablespoon of agave or pure maple syrup. 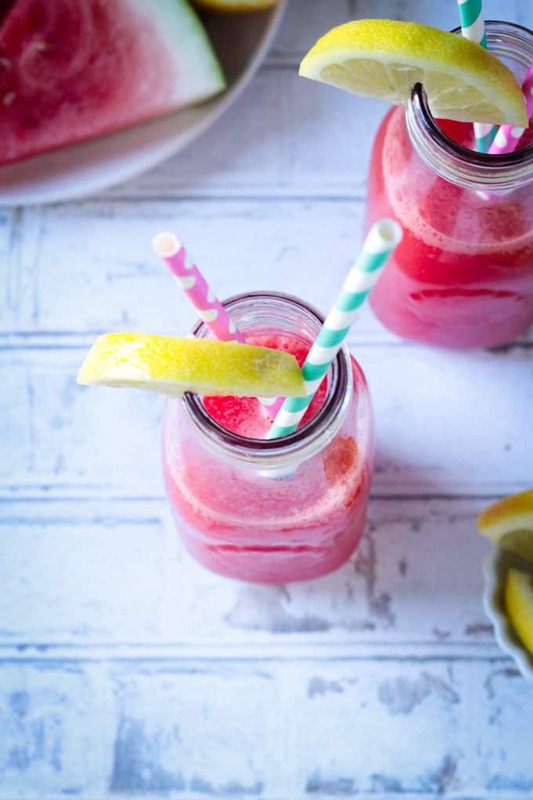 I hope you love this Easy Watermelon Juice recipe as much as we do. If you try it, please come back and leave me a comment below with your feedback and star rating. You can also find me on social media. Be sure to tag @veggie_inspired and #veggieinspired so I’m sure to see it. Enjoy! 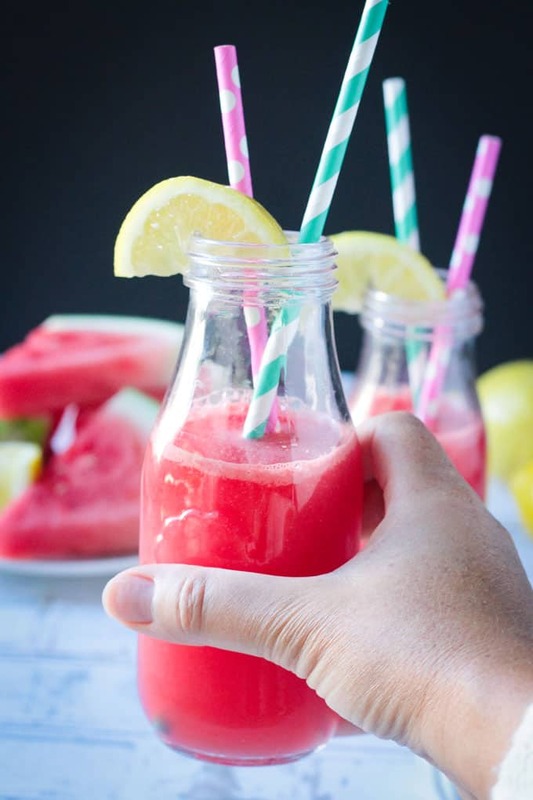 Easy Watermelon Juice - just three ingredients and quickly made in a blender! Super refreshing and hydrating. 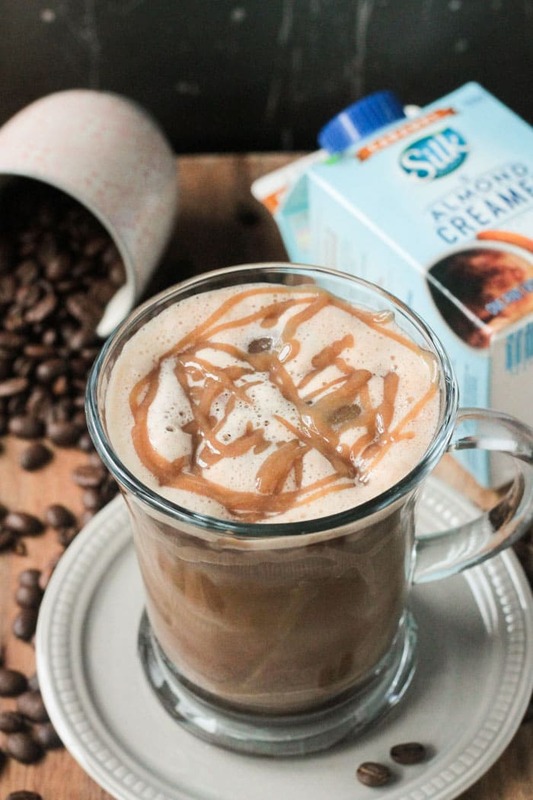 The perfect summer sip! Place all ingredients into a high speed blender and purée until smooth. If you can't get your juice perfectly smooth just by blending, pour it through a fine mesh sieve into a container. ~Nutrition facts calculated without added sweetener.